The participants of the ENROPE Intensive Study Week #1 have been selected! 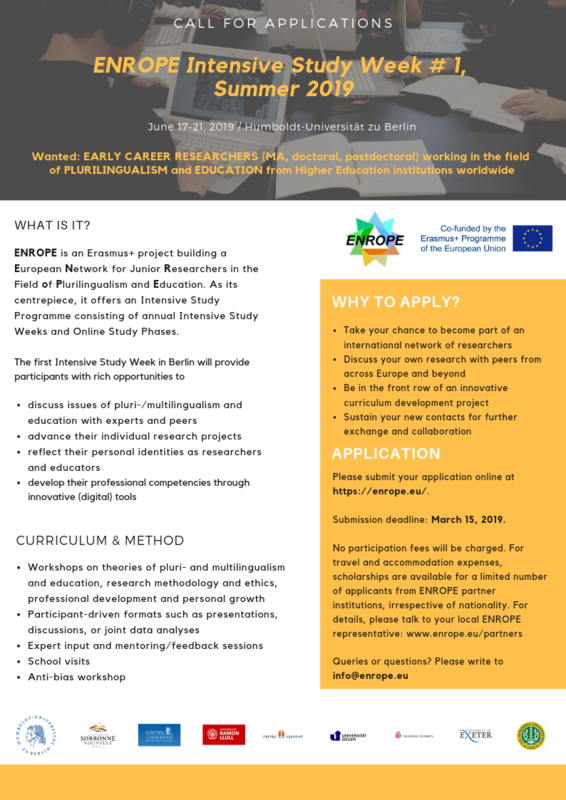 Please check your e-mails to see if you have been selected as a participant of the ENROPE Intensive Study Week #1 taking place from June 17 to 21, 2019 in Berlin. If so, please confirm by April 30. In case you cannot attend, please let us know as soon as possible so that we can give your place to a person on the waiting list. Thanks for all your applications! The selection process is now on the way and you will soon hear back from the ENROPE-team. Please submit your email address to info@enrope.eu if you haven"t so far. On 10th and 11th September 2018 representatives of all project partners came together at Goethe University in Frankfurt a.M. for an intensive exchange of ideas relating to ENROPE`s project development: the ENROPE kick-off meeting. The two-day agenda focused on objectives, content, timelines, priorities, and technical matters; the approach itself focused on communicative and collaborative outcome-oriented activities.